Home » Association News » Campaigning Success! Here at ERF, we’re celebrating – we have just achieved our first campaigning goal to help safeguard the welfare of horses being transported from France to the UK under the guise of ‘rescuing’. Behind the scenes, we have been working extremely hard for the past 5 months to raise the plight of these animals to the notice of the authorities and to ensure their welfare and safety. On June 15th, Defra in the UK published guidelines (scroll down the page to Import of ‘rescue’ horses) for the first time in response to the growing concern over these animals – a fantastic achievement for all those involved. For the past 2 years, we have watched with increasing concern the number of horses being advertised as ‘rescues’ on several new UK websites. Many of these animals were clearly unfit to travel (malnourished, suffering from illnesses or with conformation issues) and were bought by completely unsuitable homes in the UK. A number died or were put to sleep very soon after transport and many others needed expensive veterinary care. Even those that appeared to have found good homes often ended up on the dealing circuit or being handed over to sanctuaries already struggling to cope with the burden of unwanted horses in the UK once the enormity of the task of rehabilitating and training these horses overwhelmed their new owners. All this combined with the clear flouting of welfare regulations along the way meant that ERF needed to take effective action to help these horses. In March this year, we had a report from a distraught eye witness about a farm in France holding these ‘rescued’ horses before transport. They had been purchased from the original farmers and were being held until a full lorry load was ready to be economically shipped back the UK. Many of these animals were in very poor health and were being kept in appalling conditions. As a welfare organisation, ERF investigated this complaint further and we were horrified by the sights we saw. It was clear that the people caring for these animals were out of their depth, they had been left with far too many horses for far too long without any expert support or even financial aid and the impact on the animals was clear. We were able to take two horses away for sanctuary near by and ensured that the majority of the horses left behind were transported as quickly as possible to their new owners in the UK. This is Ugh and Jolie on their arrival…. One horse remained at the farm which we were unable to rescue since the new owner refused to accept our help, but we were able to put in place a care regime that ensured the long term safety of this horse. This experience underlined how important it was to stop more animals being placed in conditions such as these under the guise of ‘rescuing’. If animals are purchased from the meat trade, they need to be properly protected until they reach their new owners. By enlisting the help of concerned individuals and organisations in the UK, we have been able to make public the issues surrounding these ‘rescues’. We are pleased that one of the internet sites selling these animals has now implemented stronger welfare regulations to ensure that they are both travelled safely and that their new owners are aware of the difficulties they will face. Unfortunately, other sites continue to peddle these horses as ‘rescues’ and use emotional blackmail to encourage individuals to part with their money. We hope that by continuing to highlight the reality of these ‘rescues’ we will encourage individuals in the UK to rescue one of the many horses already seeking homes in the UK – one that they can see before they buy and whose future they can truly guarantee. 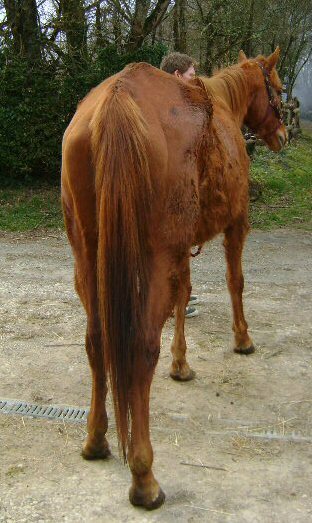 If you have any information about French ‘rescues’ that you would like to share with us, please contact is in confidence at admin@equinerescuefrance.org . Well done, you do a great job and many horses must be so thankful. Congratulations to everyone involved in this work, you are really amazing people and, even though the initial sights will be horrific in many cases, you must feel so thankful that you have been able to contribute to the improvement in life for most of these animals. Seems a stupid situation that horses are ‘rescued’ to the UK when, because of the credit crunch, so many horse owners there are unable to afford to keep their horses. You deserve the recognition for this wonderful work. Thank you Beryl, it’s good to know we have such support from our members and followers!